A sign points cast and crew toward Baby Driver, filming near the Georgia Dome. Update 3/28/16 Governor Deal announced in a press conference this morning that he will veto the religious liberty bill, HB 757. 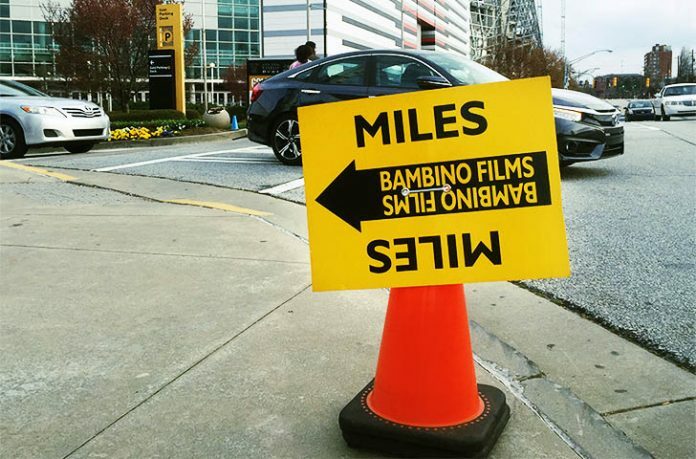 With winter firmly behind us, the busy season for Atlanta’s film industry has begun. As temperatures warm up, production crews emerge from hibernation and begin crafting our region’s movie magic. This month, there are lots of celebrities and sets to spot, and but there is also new legislation that threatens Atlanta’s film industry. Edgar Wright’s Baby Driver (MILES) has dominated the Atlanta filming scene this month. (We last reported this production was using ALMIRA signs, but it looks like we might have been wrong on that one—the production is running under MILES.) Baby Driver ended February with signs spotted on Forest Parkway and SR-85 to the southeast of Hartsfield-Jackson Atlanta International Airport. It then moved to Midtown, operating near 14th and Williams Streets. The first week of March took the production to Adair Park, where a large basecamp, visible from Murphy Avenue, was set up at The Metropolitan. After that, crews worked around Georgia State University on March 7. 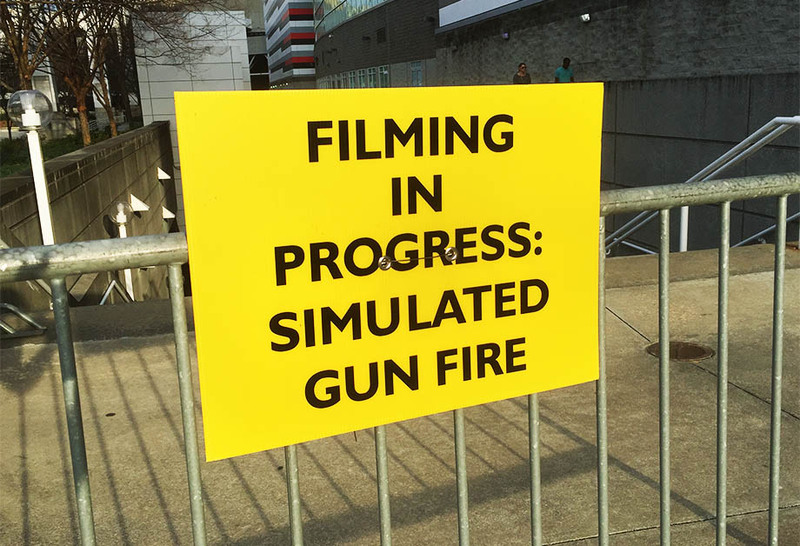 The next weekend, MILES signs and rare “simulated gunfire” warnings were spotted at the Georgia Dome. Even our OTP friends got a chance to spot Jon Hamm, Kevin Spacey, Jamie Foxx, Lily James, or Ansel Elgort when the film shot at the fictional (and aptly named) Perimeter Trust bank in Dunwoody on March 17 and 18. Most recently, crews were spotted near Georgia Tech this week. Last month, we previewed Hidden Figures (ROCKO), the historical film centering on the African-American mathematicians who were crucial in the early days of NASA. Production has now started, bringing with it Octavia Spencer, Kevin Costner, Taraji P. Henson, and Kirsten Dunst. Crews worked in Brooks on March 4. More filming took place at the Lockheed Martin complex at Dobbins Air Reserve Base on March 15. Since then, 1950s-era cars and clothing have taken over downtown Monroe. Look out for future shoots in Canton. Thank You For Your Service (TYP), starring Haley Bennett, Miles Teller, and Amy Schumer, continued its Atlanta stint in March. After working in Gainesville, crews finished out February in northwest Atlanta, with signs posted on Bolton Road. On March 2 through 4, interior scenes were shot at Gwinnett Place Mall. On March 11, production moved out to Powder Springs. More recently, on March 19, they were near Georgia Tech, and this past Monday, a funeral scene was shot at the Marietta Confederate Cemetery. Did you know that it’s pilot season? Once again, Atlanta is flush with new shows trying to make the lineup for the upcoming fall TV season. Right now, ABC is either shooting or gearing up for three pilots—Hail Mary, Notorious, and The Jury. FOX is getting ready to start on Making History. Currently, only Notorious (NOTOR) has made an appearance in the metro area. Signs were spotted in Midtown in mid-March. On March 17 and 18, some work was done off of Northland Drive, with a basecamp on Peachtree Dunwoody Road and Windsor Parkway. We also saw signs for NOTOR off of the Downtown Connector’s southbound 17th/14th/10th exit on March 22, as well as a basecamp near 14th and Spring Streets. Notorious is based on the lives of criminal defense attorney Mark Geragos and Larry King Live producer Wendy Walker. In more TV news, AMC’s 1980s tech drama Halt and Catch Fire (HCF) has begun shooting its third season. Signs were plopped yesterday on Johnson Ferry Road and the Glenridge Connector. Starz’s Survivor’s Remorse (SRS3) also continues to film its third season, spotted at the Gold Room on March 2 and 3, and in Duluth on March 9. Winona Ryder’s Stranger Things (ST) has wrapped, finishing up in Stockbridge in February and off of Briarcliff Road on March 7. Devious Maids (DM) shot a jail scene in Stone Mountain on March 22. Oprah’s Greenleaf (GL) was at the Cigar City Club in Buckhead on March 8. NBC’s American Ninja Warrior filmed its Atlanta qualifying course from March 18 through 20 in the shadow of Turner Field. The Originals (TOGS) shot in Madison in early March and in Conyers on March 23. Its parent show, The Vampire Diaries (LOC), was in Decatur on March 22. Lastly this month, we need to talk about HB 757, or as you probably know it, the religious liberty bill. Disney has said they will pull productions out of Georgia if Governor Nathan Deal signs the bill into law. In addition, AMC, Viacom, and 21st Century Fox have issued statements condemning the bill. Even Time Warner, the parent company of Atlanta-based Turner, which owns CNN and Cartoon Network, has strongly decried Georgia’s actions. While none of those networks have technically threatened to leave, one can assume the option is always on the table. 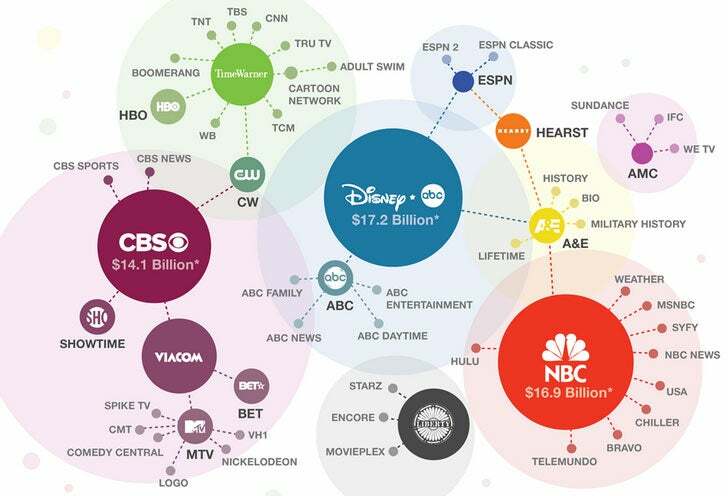 If you don’t think that’s a big deal, take a look at this chart that shows how media networks are connected. If Disney, 21st Century Fox, Viacom, Time Warner, and AMC pull out, we could lose Notorious, Hail Mary, The Jury, Halt and Catch Fire, The Walking Dead, Donald Glover’s Atlanta series, and Being Mary Jane, and that’s just the current television shows. For films, we’d lose any future Marvel releases (which dominate Pinewood Studios and include the upcoming Guardians of the Galaxy sequel), as well as anything produced by Paramount or Fox. Movies shoot here because it is economical for them to do so, plain and simple, and there will always be other states with tax breaks. If Governor Deal signs HB 757 into law, it could begin a slow bleed of Georgia’s film industry, giving other states leverage to siphon off production after production. Here’s hoping the Hollywood of the South, which we’ve spent a fair amount of money to get up and running, won’t be done in by politicians pushing a dubious legacy.